2. High quality steel tube bending and welding technique,with satin powder coating. 3. This centre stand is conceived to fit any sport bike. 4. Its handiness and ease-of-use allow quick removal of the single shock absorber and the wheels. Ideal to store the bike during winter months. 5. Available adapters fit for different bikes: 1) 10mm pins; 2) 8mm/15mm pin; 3) 12mm pin; 4) 15mm pin. stand, motorcyle paddock stand, rear stand, front stand, motorcyle headlift. 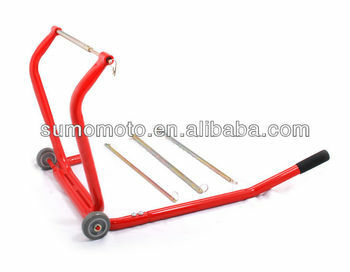 Stand, motorcycle stand, lift stand, atv stand, motocross stand, Motorbike stand, atv stand, motorcycle lift stand, china stand, motocross stand, dirt bike stand, dirtbike stand, mx stand, lifting stand, x-stand, mx lift stand, rear stand, front stand, side stand, padlock stand, stand, bike lift, lifting, aluminium, aluminum, x stand, scooter--Stand, aluminum stand, aluminium stand, aluminium motorcycle stand, aluminum motor. Hangzhou Sumomoto Industries Co., Ltd.